Supporters of the OWS-Los Angeles movement made their presence known on Friday. Out in force, they marched enthusiastically from City Hall to the financial district to once again highlight their cause; to bring scrutiny to the inequities of the financial system. The system, who through its corporate greed and lust for perpetual profit, crashed the entire world economy and destroyed the American middle class. 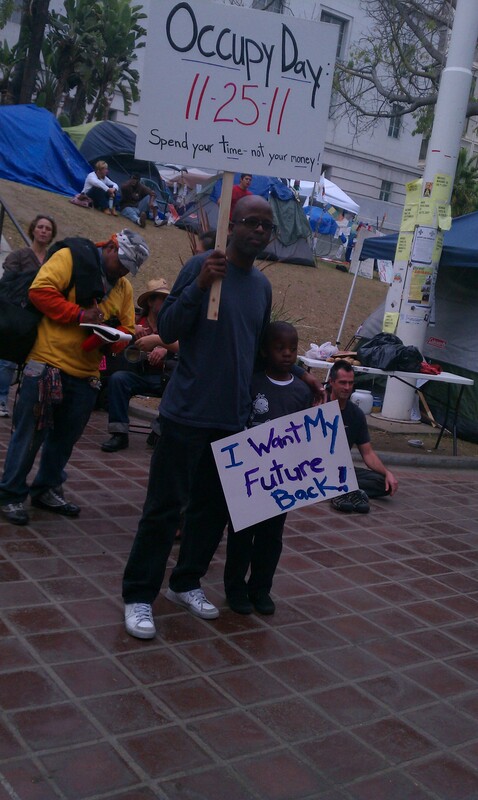 Contrary to Right wing talking points, the residents of Occupy Los Angeles were wonderful people. There were people from different walks of life, different ages, races, and ideologies, but they were all there under the same umbrella, with the same desire in their hearts: to make America strong again. To make America again the place where our children and grandchildren have the opportunity for an excellent education and a promising future. Really informative blog post.Thanks Again. Cool…. I truly appreciate this article post.Thanks Again. Fantastic….